As remote as our working areas, and as spread out as our staffs are, all of us strive to continually stay in touch with each other. This is no easy feat, but we are a determined lot. Here are a few examples of just how we do the almost impossible. 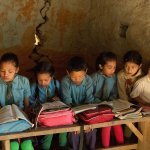 Our social mobilizer Tulasa sends us photo and other email updates to Kathmandu from our field of Khotang regularly. 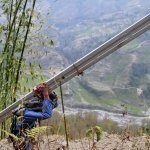 She walks an hour away from her home almost every week to reach a chautari (resting place) place where she can have some phone signal to connect to internet. She carries her laptop and her mobile phone with her. First she transfers all necessary files and photos from laptop onto her phone. The internet is really slow via a laptop, so everything that needs to be sent has to go onto her phone first. Tulasa then sends the photos and documents to our Kathmandu office via her phone. It is a slow and laborious process, but her hard work makes it possible for us to share our progress with a global audience. We are very used to such “mobile workstations” while out in the field. 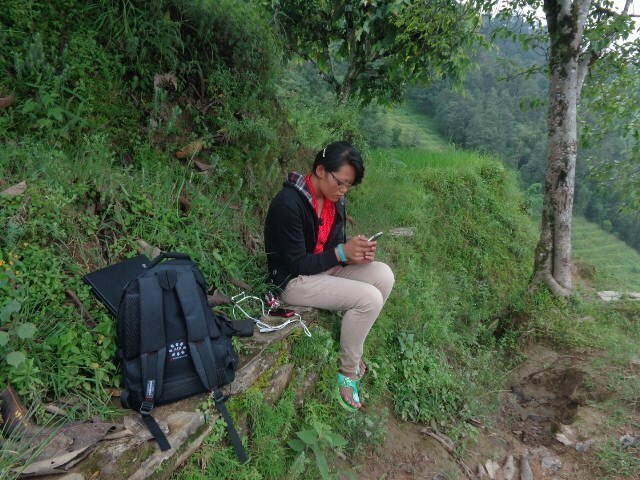 Here is our Solukhumbu Program Coordinator Jitna Janam Rai operating his very own mobile workstation as this is where he got a very good signal to report to Kathmandu office. 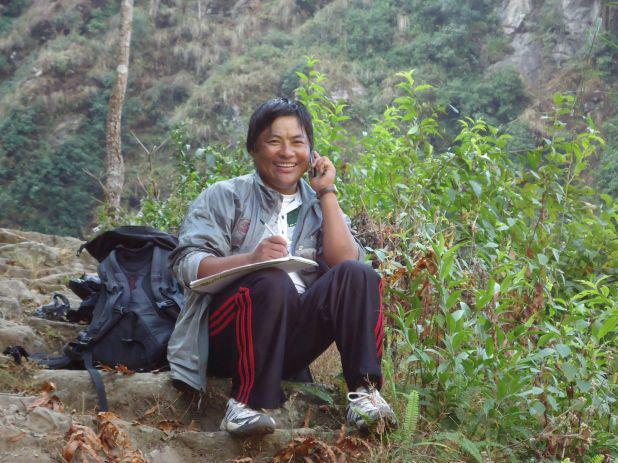 Our Khotang Program Coordinator Gyan Bhattarai has climbed this hill to get a better signal on his phone. 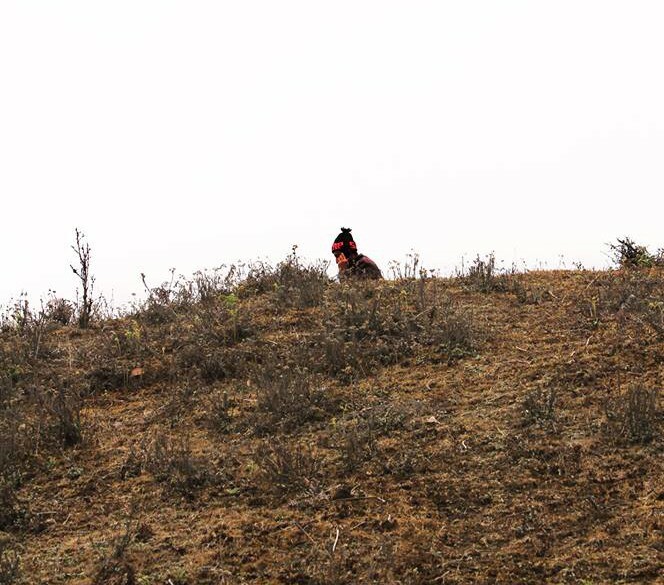 Gyan climbs such hillocks almost everyday, as do many of us. 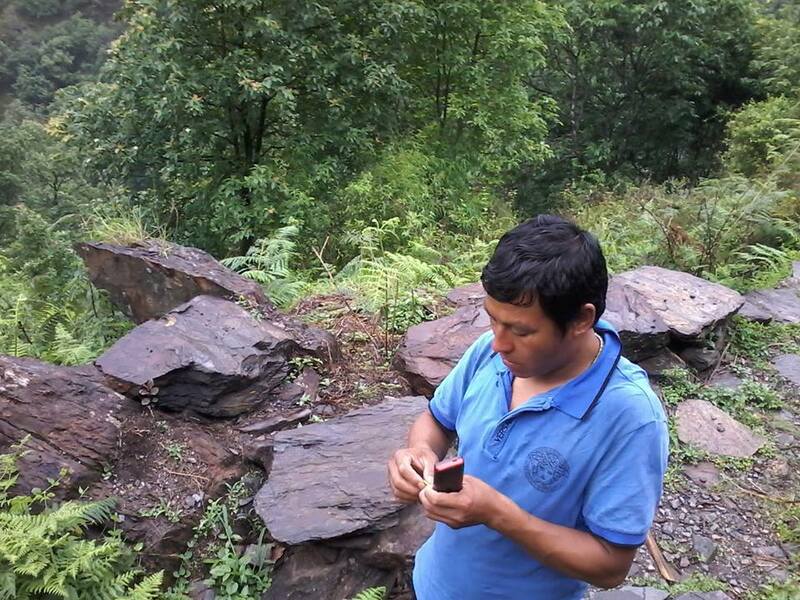 In the next photo, Bhala Kaji Rai, our M & E assistant is changing his SIM card. Often we carry SIM cards from more than one service provider as no single network works uniformly across our working area. In many places, we do not get any signal from any provider but we have trialed so many times with so many SIM now we have at least a reasonable map of what works where. Figuring out a way to connect within our team is a daily part of our work. The determined look on Bhalakaji’s face says it all. Previous This is how things start!